Last weekend, hundreds of thousands of people tuned in online as some of the most competitive athletes of our times faced off against one another. And no, we’re not talking about Wimbledon or the Women’s World Cup but the Dreamhack festival in Sweden, which is one of the largest video gaming events in the world. A Dreamhack contest around the popular game League of Legends alone attracted more than 200,000 simultaneous viewers, according to live streaming video game provider own3D.tv. The Austria-based company is only one of a number of services specializing in broadcasting video game contests — sometimes also called e-sports events — online. All of them are seeing explosive growth, as live webcasts are taking competitive video gaming to the next level, translating it from a sport for insiders to one that is watched by millions. Own3D.tv began streaming video games online in 2010, and the company now sees more than four million unique viewers per month for its live streams. Own3D.tv CEO Zvetan Dragulev told me during a phone conversation today that the site saw some 250 Gbps of traffic throughput during the Dreamhack event alone, which he attributed in part to the fact that 95 percent of the audience was watching the games in HD, with most streaming at a rate of 1.8 Mbps. U.S.-based Major League Gaming (MLG) has also seen record audiences in recent months, attracting 117,000 peak concurrent stream views at the Columbus Pro Circuit gaming competition earlier this month. During the weekend of that competition, MLG clocked more than 22.6 million streams. And live streaming provider Justin.tv has seen e-sports streaming grow so fast that it decided to dedicate an entire site to it. The company launched TwitchTV earlier this month after gaming accounted for around 3.2 million monthly uniques on its main site. Justin.tv Marketing and Communications VP Matthew DiPietro attributed much of this growth to the fact that, for the first time ever, competitive gaming has the chance to reach its full potential audience, thanks to live streaming. “We now have a distribution platform that turns e-sports into a truly live sporting event,” he said. Sites like TwitchTV and own3D.tv see most of their traffic around events, but they also feature dozens of live video feeds of people playing popular games at any given time. Some of these are just amateurs that like to show off their skills to fellow gamers, but others are actually professional teams preparing for the next big tournament. “It’s like watching a training session of FC Barcelona,” said Dragulev. 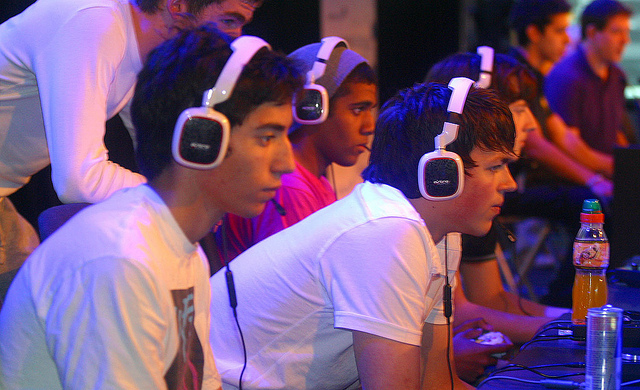 Gamers are increasingly monetizing their matches, with live video streaming offering another way to make a living. Live streaming sites have revenue-sharing deals with their professional gaming partners, and DiPietro said that advertisers love the fact that they can cater to such a well-defined audience. Dragulev explained that his company gets 90 percent of its video views from professional teams and events, which attract much higher CPM rates than traditional user-generated live streams. “We want to compete with real TV budgets,” he said. Part of the secret sauce of video game live streaming has to do with very particular technical issues. DiPietro said that gamers require capabilities to stream from various consoles, and Dragulev told me that his company broadcasts feeds from competitions with a few seconds of delay to prevent competing teams from gathering intelligence about potential targets on the live stream. But a bigger piece of the puzzle has been for own3D.tv to distribute the vastly growing traffic of e-sports live streaming across a number of CDNs, simply because this really is a global phenomenon: Only between 15 and 18 percent of all viewers that tune into streams from own3D.tv come from the U.S., and almost as many viewers come from Russia. Dragulev believes that this international focus will be key to taking live streaming of competitive gaming to the next step. “The gaming market is just in its infancy,” he told me.